I admit, chocolate and grapes are a different kind of combination, but this fruit explodes sweet juice when you bite into it. So if the green grape is covered with chocolate, the exploding juice is mixed with smooth, creamy chocolate in your mouth and the combination just works! No recipe needed here- you are looking at your ingredients. 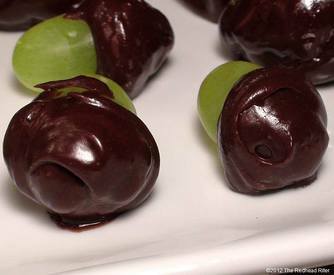 But- do you want to know why life is like Chocolate Covered Green Grape?